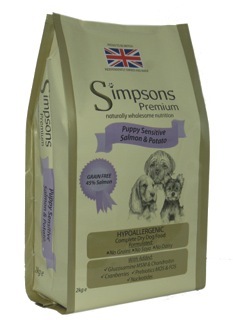 Simpsons Premium Puppy Sensitive Salmon & Potato is a nutritious balanced grain free diet that is suitable for the early weaning stage for all breeds. 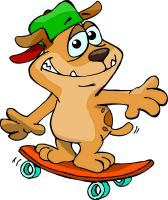 Suitable through to adult height for small/medium breeds. 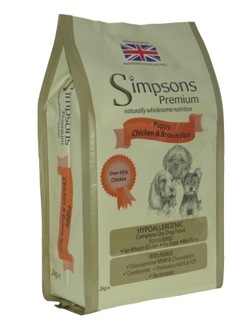 Suitable for Large Breeds up to 18 months. 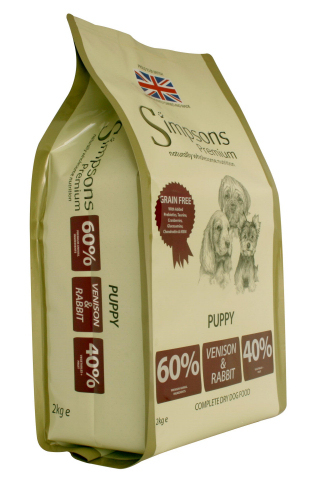 An ideal food for puppies with sensitive skin and/or delicate digestions. 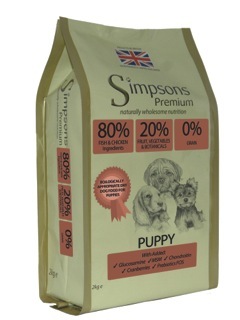 Made with a total of *45% Salmon it is very digestible and highly palatable making it ideal for fussy eaters and containing all the necessary vitamins and minerals for growing puppies. Salmon (min 45% – Deboned Salmon,Dried Salmon), Potato (min 26%), Sunflower Oil, Beet Pulp, Potato Protein, Dried Egg, Salmon Oil, Salmon Stock, Vitamins, Brewers Yeast, Minerals, Linseeds, Mannanoligosaccharides (MOS), Fructooligosaccharides (FOS), Yucca Extract, Cranberries, Nucleotides, Glucosamine, MSM, Chondroitin.